When I first met Beth, she watched me with her blue eyes and serious face. I was part of her new school brigade of teachers where she would now be included in a regular class setting, unlike the previous one where she was with special needs students. Her body language in the beginning, was unbending. She would stand and stare at the kids and they would stare back. With her eyes cast downward, she’d tighten her grip on her doll, that she calls, “Baby- baby,” and keep it close to her heart. At first, I would hold onto Beth’s arm, or her hand. I was afraid to let go. She proved me right. Her quick exits under the desk where she would take her shoes off were dramatic for me. As deep sighs rose out of my frustration I spoke in annunciated words, “Come out from under there we need to get your shoes on.” She would laugh at me. I would bend over and look at her under the desk, move it and she would scramble into the unreachable part. She laughed like we were playing a game. She dared me to take her out by pushing herself further against the wall. It was new for both of us. What she most likely did before was not going to work here. Beth was taking all of us who care for her on a new path. I realized, even though she is a ten-year-old with Down syndrome, she is also just like any other child. Her functional age may be three-to-four years old. During her days in school, she spends time in the gym, first grade, fourth grade, which is her homeroom, and in kindergarten. I have begun to take pictures of her and talk to her about her world. She identifies her family, her dogs, yet when she sees herself she gets quiet. “That’s you,” I say when her picture comes across the camera. She gets still. She say’s nothing. We teach each other. We are students in each other’s lives. The school that enrolled her and encouraged us to find some medium of learning during our days, inadvertently encouraged much joy in life as moment-to-moment laughter comes from both of us. After nine weeks of routine, Beth continues to prove to me that it’s not that my inexperience was wrong, but we are truly human beings in a spectrum of life where consideration for that which is perhaps different, is a variation on a theme. She hasn’t run under the desk lately. She takes her seat and sits at the table and distributes the words for the spelling game, Popcorn, to the other students. She uses her classmates’ names, and they grow with her being in the classroom, as well. They watch her. They smile at her baby. They help her along her travels in the halls and greet her as they would a star. Beth is showing us that she can learn, she can adapt, and she is rising to the comfort of new friends. Her gift could easily be her journey of adaptability. Beth’s presence impacts everyone. Her father, Skeeter Brewer, believes that anyone can be anything they want to. For him, the sky is the limit for his daughter. She traces over sentences that have her name in it. She prefers the color yellow, when picking crayons, and her two older siblings have contributed to her exciting world of happiness. I watch her walk down the hall toward her next class at school. 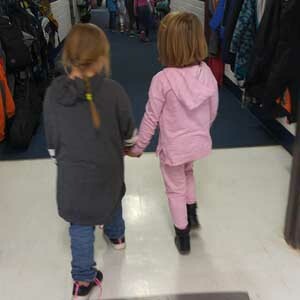 Her hand is held by a classmate who makes sure she gets to her destination in the SPED room. Her left foot turns in slightly as she takes big steps. Mr. Brewer is very pleased with the school. “They’ve been to seven-schools,” he said, including his other two children who also attend the Concho Elementary School. “She’s a little bit more verbal,” he says. “She didn’t walk until she was three-years-old and had speech and physical therapy at home when they were living in Syracuse, New York. Today, outside their home in Concho, she runs around with her brother, climbs over a dog house, jumps on her trampoline, then runs back to her father to put her arms around him. “I don’t plan a future for my kids. I don’t know if she will ever leave home. I don’t care if she doesn’t,” he says. The idea that she is different is true. Her individuality, like any kid, is in the forefront of how we all care for her. We sing songs like, “Twinkle-Twinkle Little Star.” She says her dog’s name over and over again … “Sarah, Sarah…” and when I tell her during recess to, “Get that swing,” we no longer have to hold hands. She runs toward one of her happier places in school where she puts Baby-baby on the ground and sings to the sky. As my pen began to shadow on my pad, and the winds of Concho collide, the joy of love and beauty takes over at the Brewer place in the hills, where the open land encourages the children to be who and what they are.